Another drawback of year-round school that starts in July: While everyone else frantically chases new shoes and backpacks, that was so two months ago for us. And with that out of the way, the guys have started trying to fast-forward the calendar to holidays. Which I’d be OK with if they could agree on how far to jump. Ever spend an evening refereeing brotherly bickering with no possible victor? There is one advantage, though, to a no-fault sibling argument: If you can’t declare a winner, you can’t possibly play favorites. In a way Big Guy won, because he wanted to skip to Christmas and we just happened to have an tiny tree in the garage. 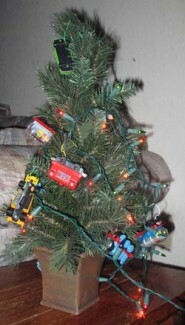 He lugged the tree to the living room, where they trimmed it with Hot Wheels and miniature Thomases — I drew the line at hunting the real decorations. Little Guy, though, wanted Halloween, and that’s something I didn’t have stashed way. Not that I know of, at least. There is one closet I haven’t excavated to the bottom of in three years. I’m partly to blame for his confusion. When he asked if they could go trick-or-treating in the dark, I didn’t know he meant tonight. I realized my mistake, though, as soon as the sun went down. “”Time to go trick or treating!”" he cheered. “”No, honey, not yet. Halloween’s two months away.”"
“”I thought you said Christmas is two months away,”" Big Guy interrupted. “”No, hon. It’s Halloween two months, Thanksgiving three months, Christmas four months.”"
“”No, it’s not. I want Christmas in two months!”"
“”I want pumbkin candles now!“” Little Guy bellowed. Great. Why couldn’t he want candy now? I could have faked that — I actually know which closet holds their trick or treat bags. I tried explaining that pumpkins aren’t ready. They’re still green and the farmers can’t pick them, I said. Mollified momentarily, he took off to share his new scientific knowledge. “”Hey, pumbkins are green!”" he crowed to his brother. “”No they’re not. Pumpkins are orange. Christmas trees are green. And I want Christmas!”"
The green vs. orange pumpkin debate raged long enough for me to finish cooking dinner in peace, so I guess there was an up side. Hostilities resume shortly after their bath. “”Hey, Mom, can we find the North Pole on your computer?”" Big Guy asked. “”I want pumbkins!”" Little Guy said, this time batting his eyes in hopes he could charm a jack-o-lantern into the house. I couldn’t find a suitable North Pole site, so once again, no winner. Big Guy gave up, but Little Guy wouldn’t let go. “”Mommy, can we watch pumbkins now?”" he pleaded. We revisited the “”pumpkins are green”" debate and I promised to bring home the first pumpkin I see in a store. It was a full five minutes before he abandoned additional requests for pumpkins, watching pumpkins or candles. I have a feeling he’ll rev up again, though, the second he sees the Christmas tree in the morning.